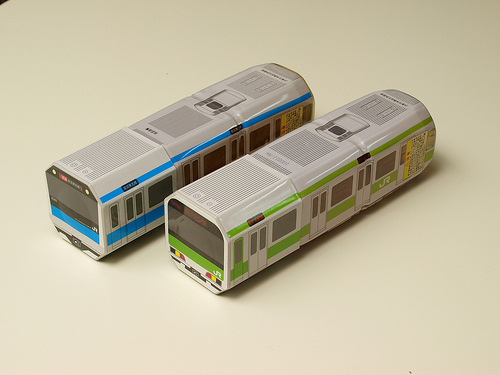 These trains were introduced in the stationery king, Bungu-o’s blog. Look at the whole bodies. 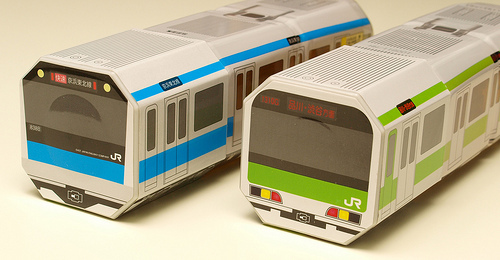 The green one is a train of JR [W:Yamanote Line], which is probably the most famous rail line. As you can see, the front part is a cap and the rest part is an ordinary plastic bottle. The cap should be used as a cup but it’s not. It reminded Bungu-o the tea bottle with a cup sold at station with ekiben (bento to eat in a train). The price of the train shaped plastic bottled tea was 358 yen (US$3.80). A regular bottled tea costs about 150 yen (US$1.60), so it costs twice. It’s a little expensive, isn’t it!? 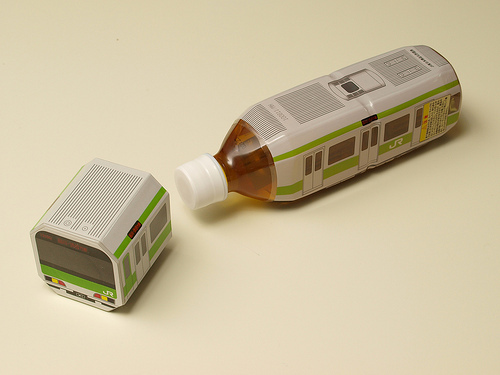 Have you seen train shaped bottled drink in your country? Or other kind unique bottles?